On Saturday night, in the middle of the night, I awoke to Milton's nose in my face, and Jeff sitting on the floor next to him. Milton had whined to go potty and, of course, he went to Jeff's side of the bed to ask to go out. It takes me a little too long to wake up and get up! 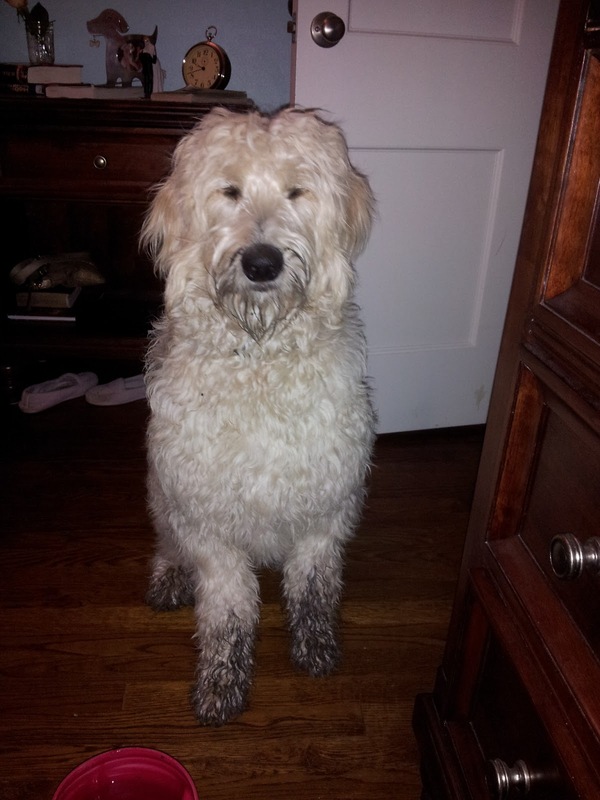 Now they had both returned, and Milton was just a little muddy. We suspect that when Milt finished his business, he thought he might just dig for a spell... why not? Late night digging might not sound like too much fun, but to our Milt, it is really quite enjoyable. It's just not so fun being Momma and Daddy double teaming on cleaning. I guess fresh dirt under the moon is just too irresistible! Something must have been in the air this weekend; my husband and I spent the weekend at my sisters and came home to muddy paw prints leading from the back door to the guest bathroom and right up to the toilet. Digging must make a guy thirsty, too. hahaha When Milt wakes up in the morning, he is SO thirsty. I don't know what gets into him!